Sarah: a 12 year old female, suffering severe abdominal pain and digestive issues for over 2 years duration. Medical and parental management included medications, probiotics and dietary restrictions. Outcome to initial exam date was poor. First time visiting a DC. She is a competitive dancer and was withdrawing from competition due to excessive symptoms. Comments by Dr. David Fletcher. 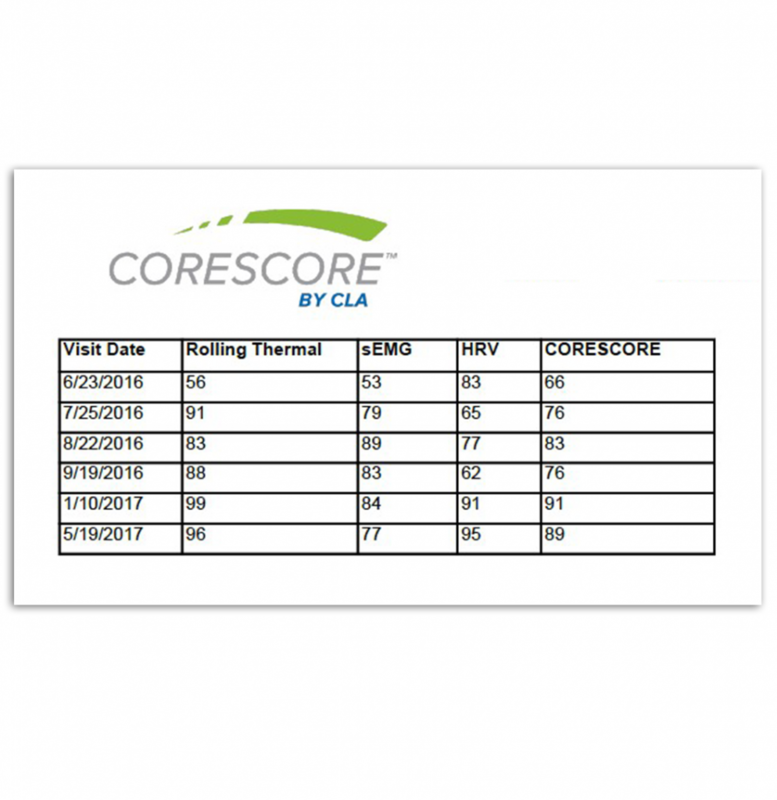 The lowered EMG and thermal score strongly influence the overall CORESCORE. This is a girl who should have good tone and good scores for her age and athletic ability but is now susceptible to losing ground because of her persistent subluxated state. The plot on the PWP rainbow graph falls within the green box area indicating a reasonable range for her HRV. However, she is low in the box and to the left side. This confirms that the patient is draining her reserve of stress resources and is beginning to live in a sympathetic dominant, fight-flight situation. This is regarded as leading to pro-inflammatory with a lowered immune responsiveness. Her sEMG pattern graph shows excessive wasting of postural energy (scores 173.1, with normal being 100) with a poorly efficient distribution of the neuromuscular signal of only 41%. Her sEMG bar graph shows excessive hypertonicity in her CT region bilaterally with hypotonicity (yellow bar) in her TL junction. Her infrared thermal scan highlights significant pre-ganglionic nerve dysfunction in the control centers that regulate the bowel and digestive core functions. Of course we care about how patients feel, but we also need to know how they function, so we look deeper into the nervous system. 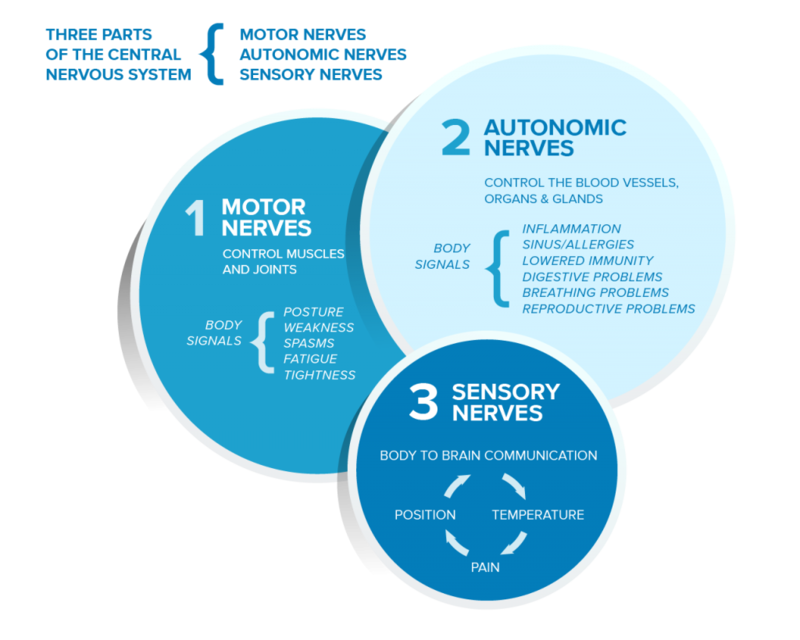 There are 3 divisions of the central nervous system and it is estimated that a much smaller percentage of nerves is dedicated to sensation when compared to the functions of movement (motor) or organ and system regulation (autonomic). 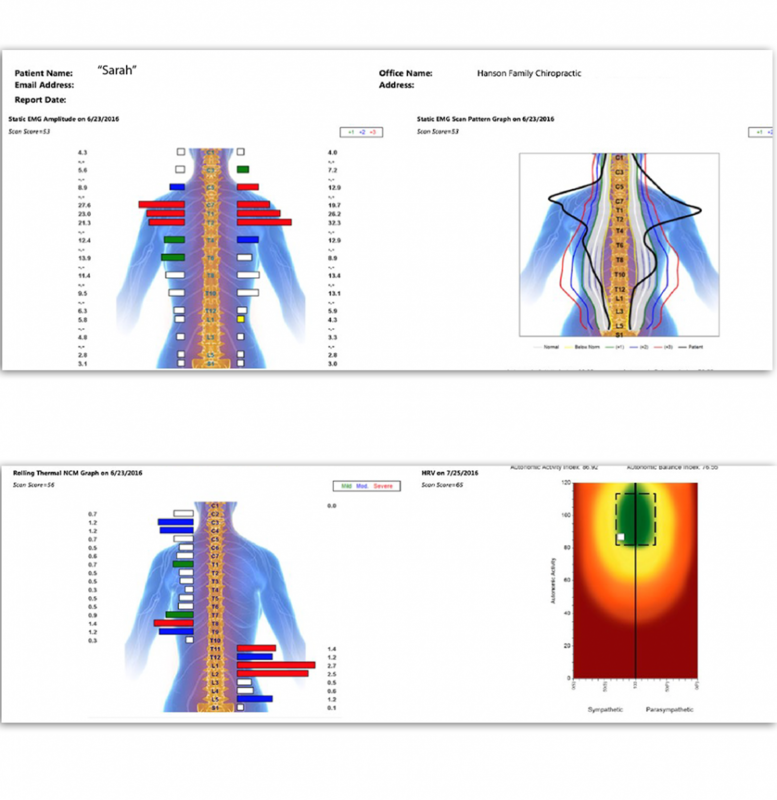 The INSiGHT scans and CORESCORE specifically measure how stress has affected the functions of the nervous system and how adjustments restore the natural tone and control. Although the PWP portion of the CORESCORE has dipped, the other metrics have improved significantly. The increase to an 83 on her CORESCORE pushes her into the Good zone in a very short time frame of just 8 weeks. The plot on the PWP rainbow graph continues to drop to the mid-lower, left side of the graph indicating a strong remaining Sympathetic shift. In reality, it’s most likely due to poor Parasympathetic tone being able to modulate the recovery and balance. This scan confirms that the stress response to Sarah’s subluxation pattern has been deeply embedded into her neural processing and ANS coherence. This will be a key metric to observe over time. However, the other two scan data show exceptional improvement. Observe the reshaping of the pattern graph as reorganization takes place. It is beginning to take on the “vase-shaped” appearance which is normal. Her pattern score or distribution efficiency has increased to a remarkable 93.4%. The hyper and hypotonic responses have levelled out decreasing her total energy output to a reasonable 134. Her infrared thermal scan confirms she has broken out of the clumping and intense reactions seen in the initial scan. Although there are continuing reactions that need to be watched over time, the key to adaptability is that the patterns on the thermal scan are not “stuck” and are reorganizing under care. 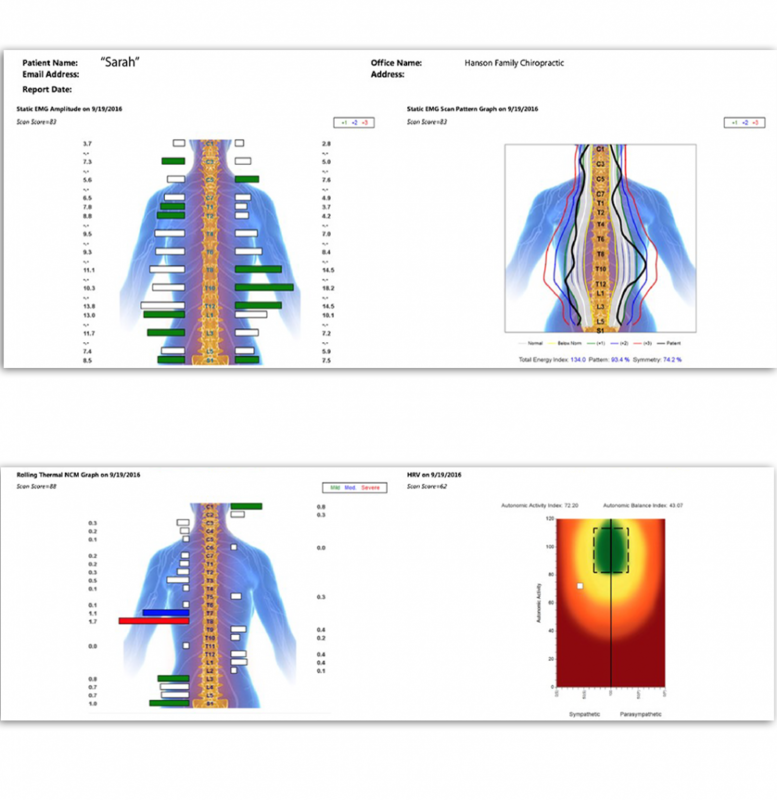 As the graphs indicate, there is a significant improvement in Sarah’s spine and neural reorganization associated with her chiropractic care plan. Her reserves(PWP/HRV) continue to increase over time all the way to 91. This is significant considering the degree of health challenges she faced. 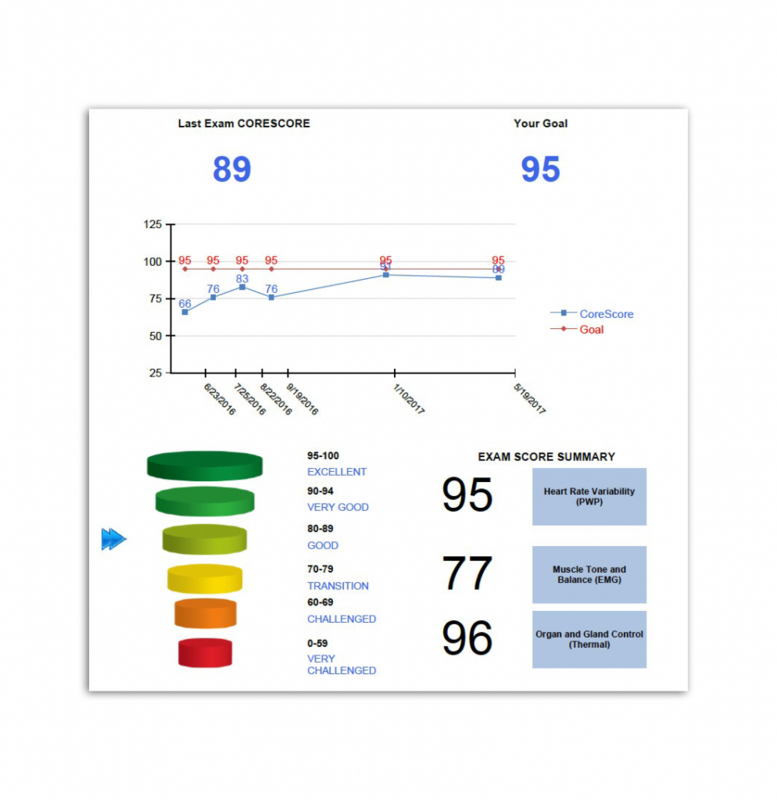 The comparative table allows the clinician and patient to track progress over time. 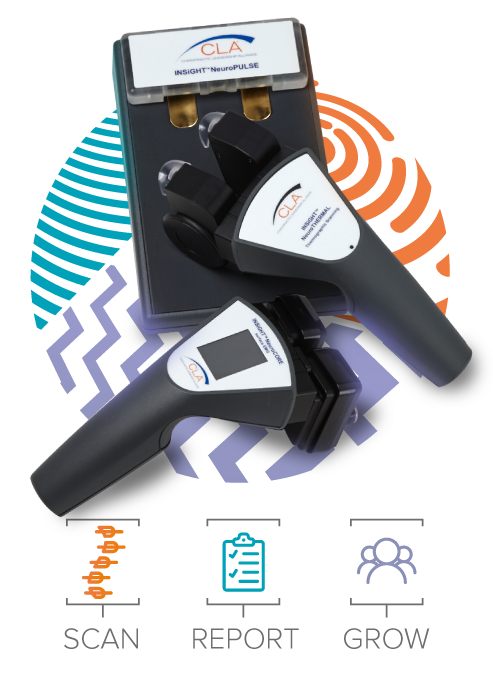 The INSiGHT neuroTECH combines all of our neurological scanning technology including into a package designed to transform any size or style of practice. 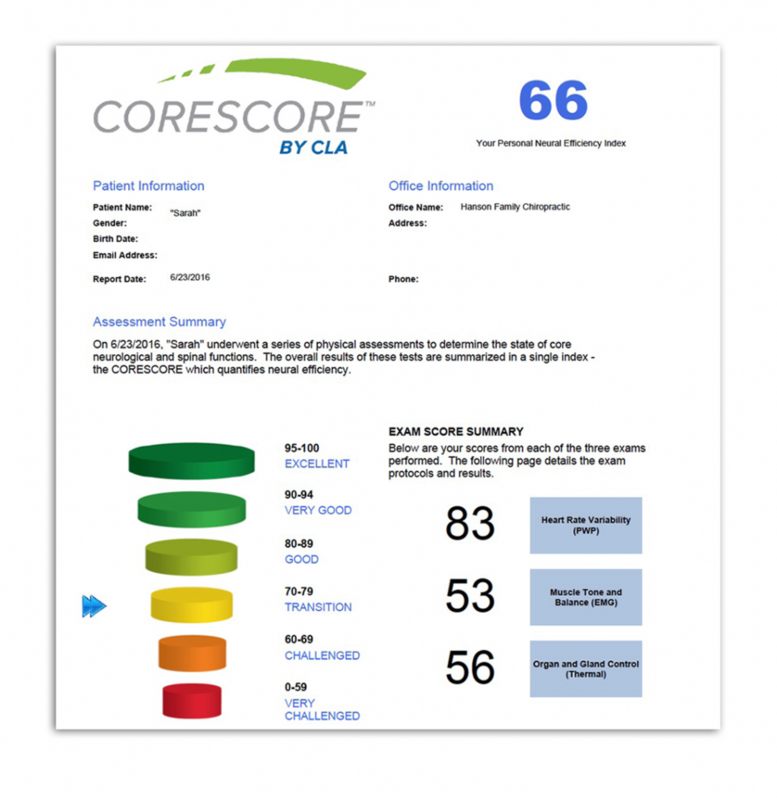 Get the accuracy of pulse wave profiling, thermography, and static electromyography combined into a single number health score and delivered on an easy-to-understand report.